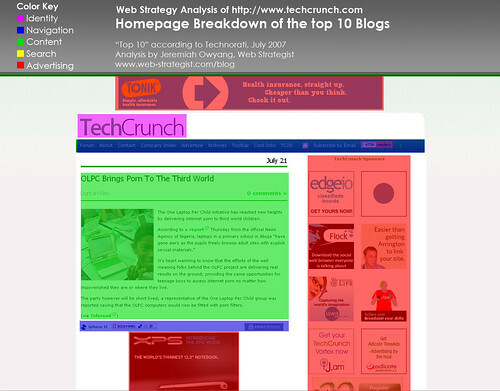 Please read part 2: A break down the top personal tech blogs, notice the difference in advertising use. 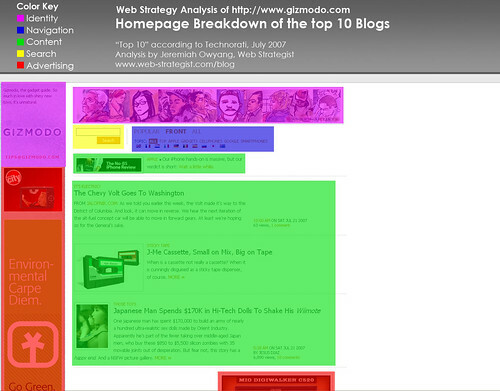 We’re all fascinated and drawn to some of the world’s top blogs, according to incoming links, Technorati has listed the top 10 blogs. 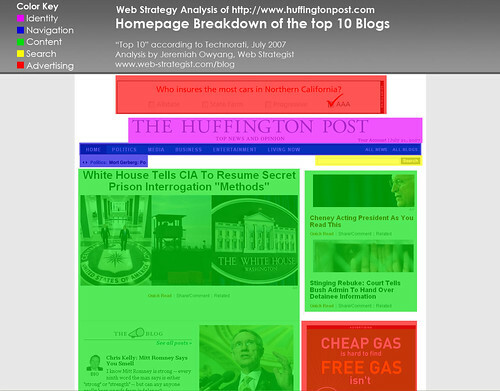 (Although that’s not the best way to determine authority) How do blogs get links to them? They do one of two things 1) Be interesting 2) Add Value. As they achieve stardom, the momentum of the brand continues it forward, and the traffic they drive to others increases it further. 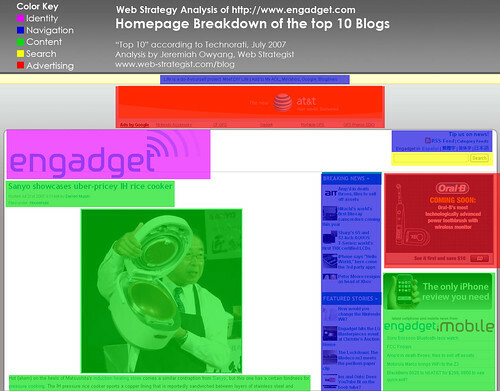 Are top blogs afflicted with excess advertising? As blogs reach nuclear status, it’s interesting to see how they start to monetize from ads, focus less on navigating away from the sites, and how much content they continue to share. At what point does the user experience suffer from excess of advertisements? I took screen captures at 1400 X 1050, a rather large size. I only took the top page view, so it showed what’s above the fold. 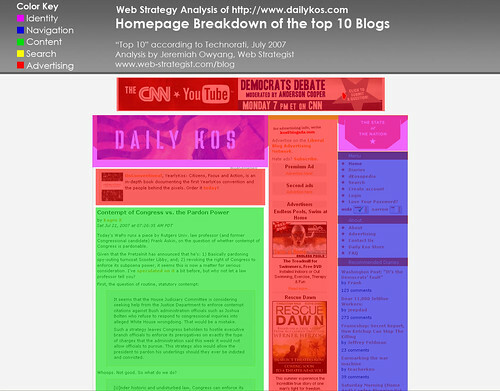 I then segmented the content types into five major color keys: Identity (as in self-brand), Navigation, Content, Search, and Advertising. 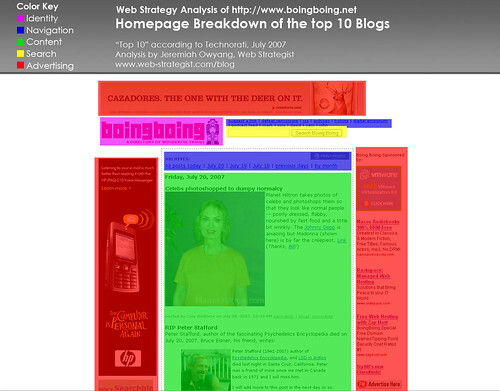 This method is modeled after Jakob Nielsen’s homepage usability book. 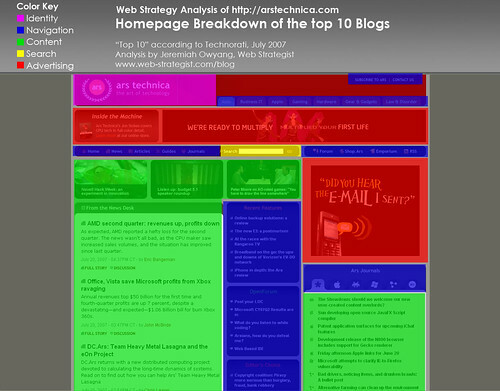 Ars Technica: the Art of Technology. News, analysis, and in depth coverage of technology. PostSecret: ongoing community art project where people mail in their secrets anonymously on one side of a homemade postcard. 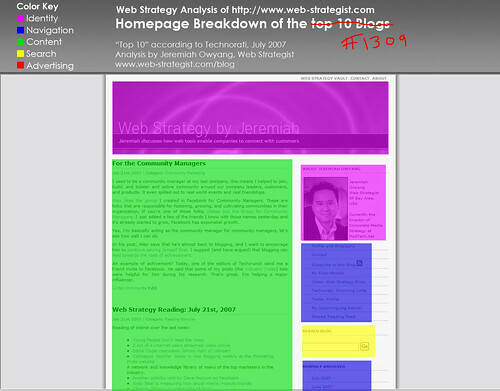 Web Strategy by Jeremiah: Jeremiah discusses how companies use the web to connect with customers. 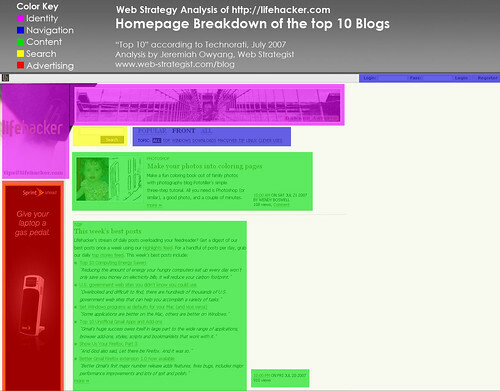 While not a top 10 blog, it’s my blog, and therefore I can analyze it. I don’t have ads on for a few reasons: 1) I don’t have significant enough traffic to sustain more than beer money. 2) I’d rather gain trust from my audience bringing good content than worrying that I may reduce credibility by putting ads on the site.